Local white-collar worker Mengmeng takes a selfie. A “square box” on Yan’an Road M., near Huashan Road, used to be a “pilgrimage” for night owls as one of the city’s most glamorous night spots. But the address, close to Yan’an Hotel, later faded out after MYST club moved. A recent “micro-renovation” project has given the abandoned site a new lease of life. 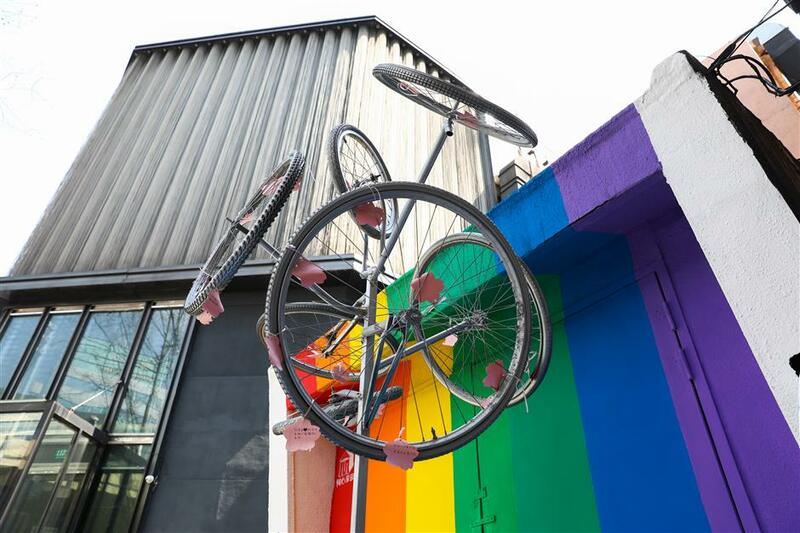 The stairs leading to the gate were painted in rainbow colors, and an eye-catching art installation made by junk bike parts was put up in front of the gate. Heart-shaped pink “wish cards” were hung on the bike hubs and tires, adding some romantic ambiance. 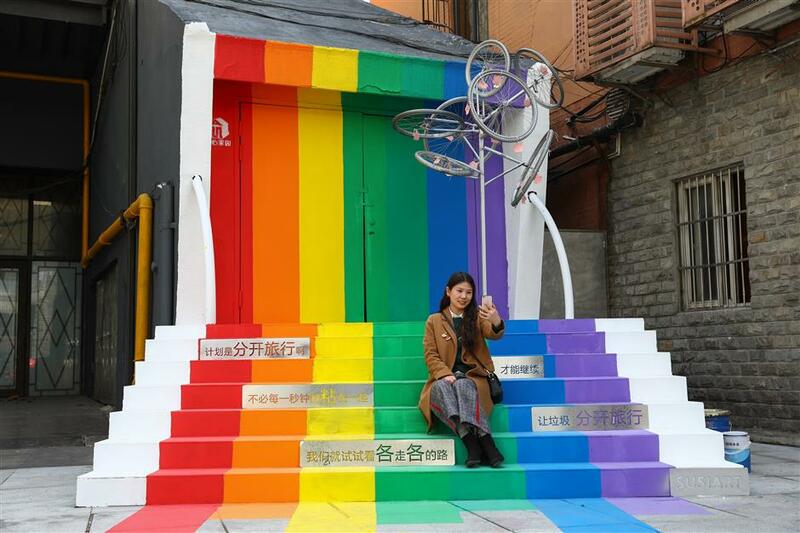 “I’ve seen many of my colleagues posting their photos with the rainbow stairs on WeChat Moments. It looked fancy and I wanted to have a look too,” said Gu Xiongwei, who works for a drug-manufacturing company just on the other side of the road. Mengmeng, a new staff member of the local memorial hall of Cai Yuanpei, was surprised to find the place during her lunch break walk. She sat down on the rainbow stairs and took selfies. “It’s such a delight,” she said. Due to property problems, after the club closed in 2017, the site was left locked, desolate and dirty. The local community decided to spruce up the once-glorious site, spending several days redecorating the staircase in rainbow hues. Besides, local officials came up with the idea to add a local touch by reusing the recycled old bikes from the community. “It has been a headache in our community that piles of bikes in disrepair are piled by roadsides and in our neighborhoods,” Zhang said. Last year, a plan emerged to allow local people to trade in their old bikes for rice, offered by Bright Dairy who have an office in the community. So far, they have collected more than 70 abandoned bikes. “We dismantled the bikes that are too old to be repaired, and used the bike hubs and tires to put up a bike tree. We especially picked the bike parts from local time-honored bike-makers such as Phoenix so as to remind locals of their childhood memories and raise people’s awareness of protecting our old brands,” he said. Zhang said local residents, white-collar workers and professional designers have discussed their expectations of the project. And indeed, they have done just that. One day last week, they found that continuous rain had flushed away some of the bright paint and they immediately told community officials. So workers came to repaint the stairs. Zhang mentioned that the volunteers patrol the community by riding bikes that were recycled but had minor damage repaired. “We fully use what we have,” he said. About two weeks ago, more than 20 residents and local white-collar workers together put up the “bike tree” and painted the stairs. They included resident Ding Xiaoming, 55. "It’s great to take part in such an event. It looks like a rainbow which makes us smile and lights up our lives," he said. "I chose to paint the purple color because I love purple."